This is the second article by Deborah Fanslow: Who Needs a DAM Librarian? Deborah is one of the editors of The DAM Directory and an MLIS qualified librarian. A PDF copy of this article can also be downloaded. In the first article of this series, I presented a timeline which clearly illustrates the increasing frequency of advocacy for librarians in DAM—a sentiment echoed across the board by practitioners, consultants, vendors, DAM news media, and academics. In order to understand why the spotlight has been cast upon librarians and the potential value that they can bring to the DAM field, one must first understand a bit about the disciplines and fields that live under the information management umbrella, the many types of information professionals that inhabit this professional landscape today, and where DAM is situated within this universe. With this understanding, the logic and wisdom of inviting and recruiting librarians into the DAM field will become more clearly evident. “Now, almost overnight, in the late twentieth and early twenty-first century, the information sciences have exploded into scientific and social validity….Ironically, however, that legitimacy has often been gained without much clarity on just what the information disciplines are all about” (para. 8, 10). Compared to the centuries-long development of “traditional” libraries and archives which emerged to manage print content, the disciplines, fields, and professions that relate to the management of digital content are relatively young. Job titles for information professionals are proliferating at a rate that won’t likely be declining anytime soon as disciplines and fields specialize, converge, and evolve to meet the challenge of managing information within a variety of digital and hybrid environments. How is a hiring manager to identify, recruit, and evaluate qualified professionals within this landscape? This guide will help you determine the type of information professionals you may encounter out in the wild. Should you set your sights on a desirable information professional and want to land one to help you get your digital assets in gear, you will be well equipped to understand the underlying skills that are endemic to all professionals within the information management family, as well as the domain specific skills that individual specimens are likely to possess as members of a specific species. Armed with this knowledge, you will be able to leverage the skills of the specimen at hand most effectively to create an ongoing, cohesive information strategy within your organization. Disclaimer: If you find yourself face to face with an information professional and you are tasked with evaluating his or her background and experience, be forewarned—although all information professionals share a common body of knowledge related to information management principles and practices, there is wide differentiation between species as a result of specialization and prior career experience, individual personalities, and the occasional mutation. and many more species yet to be cataloged. Information professional is a peculiar group of species found within a wide variety of information-saturated habitats. Appearance varies; gone are the days of identifying information professionals by their buns, spectacles, and cardigans—modern information professionals are just as likely to have piercings, tattoos, and purple hair—and they even don suits now and then. Their skill sets are as diverse as their appearance—and for the record, some have never even worked in a brick and mortar library, much less stamped a book. Information professional specimens often manifest the following dispositions: perpetual curiosity, creativity, technical fluency, a compulsive need to create order out of chaos, and an intense passion for connecting people with information. Information professional specimens from all species can often be seen raiding stashes of neglected content with unbridled enthusiasm while exclaiming, “No worries, I know just what to do with all of this…let’s centralize it, standardize it, catalog it, and share it!” More than a few specimens have been known to exclaim, “There must be a better way to make this information accessible!”. 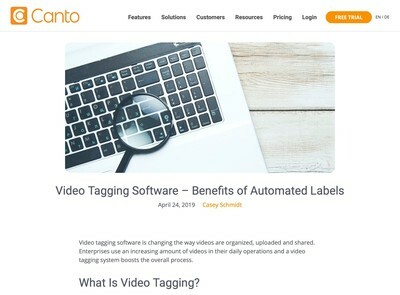 They are often seen promoting the use of digital asset management systems to arrange, describe, manage, distribute, secure, preserve, and provide access to digital content. Information professionals work on site and remotely, wherever there is data to be managed. Although all information management disciplines have the common intellectual territory of organizing and providing access to information for retrieval, the type of information collected, the organizational principles used, and the context within which information is created necessarily differs based on the strategies deemed most appropriate for providing optimal access to that information within specific communities. In a speech Dr. Bates delivered towards the end of her distinguished career (required reading for all information professionals), she noted that historically, the practice of information management and its disciplines developed in reference to the physical institutions that housed collections of information—libraries, archives, and museums (also affectionately known as LAMs) (Bates, 2012). Library science: from its inception in the late 19th century, the discipline of library science has been fundamentally centered on organizing, managing, and providing access to collections of information for users (Estabrook, 2009). The methods, standards, and practice of classifying and cataloging resources for the purposes of retrieval within information systems is well established within the library community.Because library collections historically consisted of mostly duplicate resources, efficiencies were realized through centralizing, standardizing, and sharing—not only the resources, but also the metadata used to describe and provide access to those resources (Taylor, 2009). Because of this, the strategies of centralization, standardization, and sharing have practically been imprinted within this species’ genetic code. Information science: originating around the turn of the 19th century (and known initially as the field of “documentation”), information science research was initially focused on scientific, technical, and medical information due to its base of practitioners within science and industry who were looking for ways to manage large amounts of data and resources. 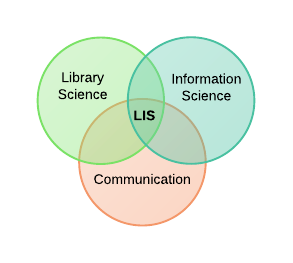 In contrast to librarians’ focus on managing collections,”Information Science is concerned with information itself and its representations—what information is; how to represent it; how to understand its functions; how it is used; and how to design systems to organize, classify, and retrieve information” (Estabrook, 2009).Today, information science is focused not only on information, but also on the interaction between people and information systems. of provenance, authenticity, and preservation are critical to maintaining this context. Because archives usually contain unique items, standardization emerged relatively recently with the emergence of digital archives (Taylor, 2009).Because of the importance given to maintaining the innate arrangement of historical records, print based archival information has traditionally been organized first by provenance (origin), and then within hierarchical structures reflecting the original order of arrangement when acquired. In the digital world, of course, information doesn’t have to live in just one place; this 19th century European approach is often augmented by access to archival collections by virtue of a number of different facets. Museum Studies (Museum Studies/Museology): museum science first emerged as an independent academic discipline during the 1950s and ‘60s (Schwarzer, 2009). Perhaps the most complex of the traditional cultural heritage institutions, museums often house not only collections of unique visual materials and cultural artifacts, but oftentimes include libraries, institutional archives, and records management programs as well. Schwarzer (2009) states that although Museum Studies saw a great deal of growth during the 1990s, debates continue regarding where it should be situated among related academic disciplines. Information systems: emerging in the 1960s, the information systems discipline (sometimes referred to as management information systems, or MIS) is defined by the University of Sydney as “…an applied discipline that studies the processes of the creation, operation, and social contexts and consequences of systems that manipulate information…” (para. 1). As with all information management disciplines, the interaction between users and information systems is a central focus. Digital librarianship: a logical extension of physical libraries, digital libraries as initially conceived were centered on building and preserving digital collections to support knowledge creation in the service of users. Calhoun (2014) stated:”Digital libraries are:1 A field of research and practice with participants from many disciplines and professions, chiefly the computer, information and library sciences; publishing; the cultural heritage sector; and education.2 Systems and services, often openly available, that (a) support the advancement of knowledge and culture; (b) contain managed collections of digital content (objects or links to objects, annotations and metadata) intended to serve the needs of defined communities; (c) often use an architecture that first emerged in the computer and information science/library domain and that typically features a repository, mechanisms supporting search and other services, resource identifiers, and user interfaces (human and machine)” (p. 18). Digital archives: Galloway (2009) wrote, “Digital archiving emerged during the 1990s as a compulsory support for digital recordkeeping in governments and digital publication in academia. Its concepts are governed generally by archival theory, while many of its practices have increasingly been borrowed from library and general information science work with digital objects” (p. 1518). Galloway asserted that the focus of digital archiving differed within libraries and archives communities due to the types of materials they contained, and the principles of information organization that developed to support retrieval within their respective contexts (2009). She emphasized the importance of combining both library and archival perspectives, and forecasted a convergence of the two fields. With the migration of data from analog to digital, the need to preserve digital information quickly became an issue of paramount importance. Digital preservation has always been part of research and practice within the digital library and digital archives communities; today, the topic is of great concern to organizations within every industry sector. Digital preservation (DP): the topic of digital preservation has developed into its own interdisciplinary research discipline (Chanod, Dobreva, Rauber, Ross, & Casarosa, 2010). Since the early 2000s, national and international coalitions and programs have been established to help advance the field. Definitions of digital preservation stemming from two of these initiatives stresses the active management of digital content over time:Library of Congress: Digital preservation is the active management of digital content over time to ensure ongoing access.Digital Preservation Coalition: [Digital Preservation] Refers to the series of managed activities necessary to ensure continued access to digital materials for as long as necessary. Knowledge management (KM): In the mid-1990s, knowledge management’s first proponents were consultants who successfully raised awareness of knowledge as a corporate asset. 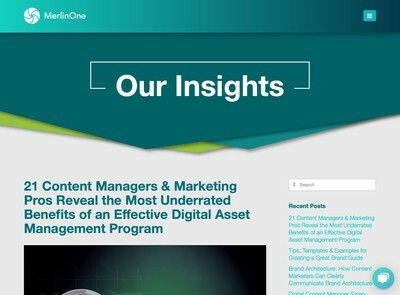 Consultants saw intranet technology as a key enabler for capturing, managing, and sharing knowledge within organizations. The focus of knowledge management practice naturally expanded to include user needs, and eventually encompassed knowledge external to organizations (Koenig & Neveroski, 2011). As the digital libraries, digital archives, and digital preservation disciplines continue to mature, Galloway’s prediction is indeed coming true. New interdisciplinary programs, coalitions, and initiatives have emerged and continue to evolve that combine the knowledge and expertise developed within all of these communities. Digital curation: Higgins (2011) aligns the development of digital curation as a discipline with the establishment of the Digital Curation Center (DCC), a UK based organization whose DCC Curation Lifecycle Model aptly illustrates the concept of both managing and preserving assets.Higgins (2011) noted that “In the UK the strategic emphasis for long-term management of digital material gradually moved from passive preservation to active curation. 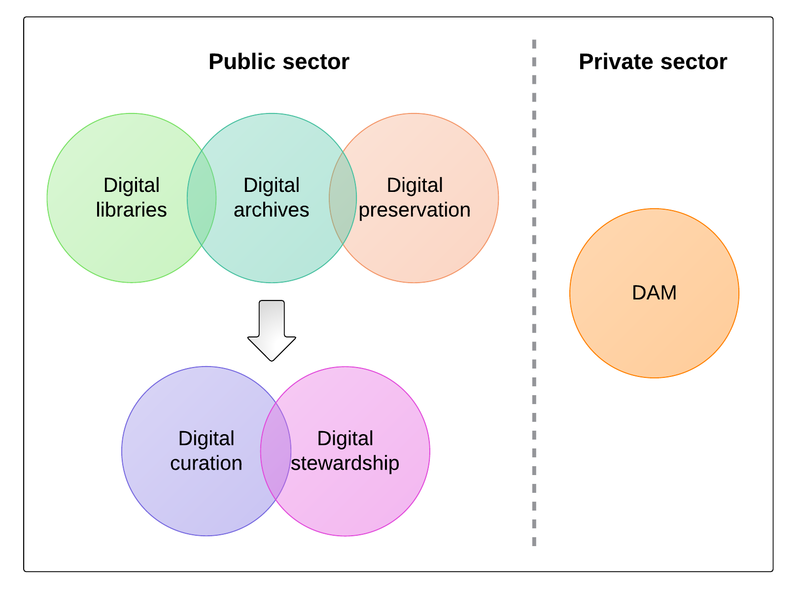 After a period of definition and consolidation, the subject now boasts a growing international professional base, a developing research agenda, practical tools and collaborative projects and a workforce trained to Higher Education level” (p. 84).Abbott’s (2008) definition of digital curation as “….the management and preservation of digital data over the long-term” can be seen as an expansion of the Library of Congress’s definition of digital preservation, with the inclusion of the “active management” component (para. 1).Initially focused on the curation of research data, the discipline of digital curation has grown to encompass an international community of organizations and practitioners within all industry sectors, and it continues to evolve today. Digital stewardship: Butch Lazorchak (2011), a digital archivist involved with the National Digital Information Infrastructure and Preservation Program, described the somewhat subtle differences between digital curation and digital stewardship:“‘Curation’ is a useful concept for describing the evolving whole-life view of digital preservation, but concentrates on underpinning activities of building and managing collections of digital assets and so does not fully describe a more broad approach to digital materials management….Enter ‘stewardship.’ ‘Stewardship’ concepts evolved out of the environmental community, but that community’s idea of holding resources in trust for future generations has long resonated in the digital preservation community” (para. 7).‘Digital stewardship’ satisfyingly brings preservation and curation together in one big, happy package, pulling in the lifecycle approach of curation along with research in digital libraries and electronic records archiving, broadening the emphasis from the e-science community on scientific data to address all digital materials, while continuing to emphasize digital preservation as a core component of action” (para. 11). 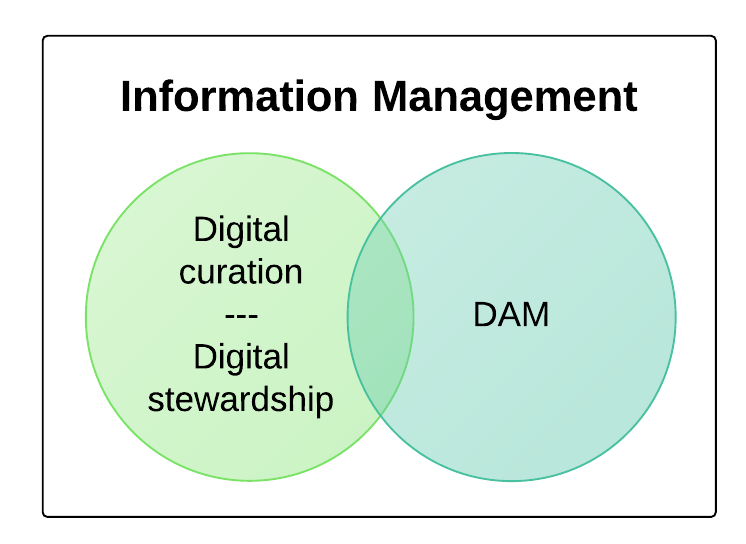 Within the Simmons School of Library and Information Science’s description of their Digital Stewardship Certificate, it is stated, “Digital stewardship represents an emerging interdisciplinary field of study and practice linking the information disciplines.” Noting that the terms “digital curation” and “digital stewardship” are frequently used interchangeably, Cloonan and Mahard (2010) described the rationale for choosing digital stewardship as the preferred term: “At Simmons, we decided to use the term digital stewardship because we want students to think about the social, cultural, economic, and political environments in which collections reside” (p. 2). Researchers and practitioners within both of these emerging disciplines have a huge pool of knowledge from which to draw based on the earlier work of the digital library, digital archives, and digital preservation communities. A significant body of knowledge and best practices have been published related to the management and preservation of digital assets by researchers and practitioners within the information management disciplines—only time will tell how the information professions will leverage this knowledge and what new species may develop in the future. 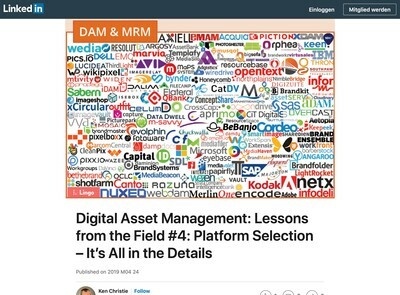 As can be seen from the field guide, every information management discipline is grappling with the challenge of managing digital assets, although within different institutional contexts. So where is DAM positioned within this array of disciplines? Information disciplines: information disciplines, or the “collection disciplines” as Bates refers to them, cut across all subject domains. As a “meta-discipline,” they are focused on the collection, organization, retrieval, presentation, and preservation of information. Researchers and practitioners within these disciplines are interested in information seeking, information transfer, and information products (Bates, 2007). DAM: in a recent DAM Guru interview, DAM consultant John Horodyski shared his definition: “DAM consists of the management tasks and technological functionality designed to enhance the inventory, control and distribution of digital assets (rich media such as photographs, videos, graphics, logos, marketing collateral) surrounding the ingestion, annotation, cataloguing, storage, retrieval and distribution of digital assets for use and reuse in marketing and / or business operations” (DAM Guru Talk, para. 3). 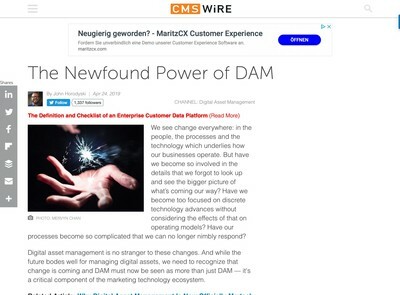 Based on these definitions, DAM can be seen as a field (and emerging discipline) under the information management umbrella that focuses on managing specific types of information (rich media) within a specific organizational context (marketing/business operations). Bates (2007) asserted that “….what distinguishes the information disciplines is that our “home” universe of study and observation is the universe of documentation” (para. 26). According to Bates, the universe of documentation consists of recorded information—including rich media (fig. 5). This unequivocally positions DAM within the intellectual territory of the information management disciplines. No matter the semantics, professionals within all of these disciplines and fields are grappling with similar challenges—how to effectively acquire, manage, preserve, repurpose, and provide access to digital assets for various purposes. Indeed, the DAM Foundation Salary Survey administered in 2011 confirmed that practitioners across industry sectors are all performing similar tasks that require the same skills. It is for this reason that DAM consultants, practitioners, and even a few vendors have advocated more strongly within the past few years for the recruitment of qualified librarians and archivists within the DAM field. With a professional organization, a peer-reviewed journal, a thriving community of practice, and educational programs in development, DAM seems to be on the path to becoming a discipline in its own right. As David Diamond suggested, to not leverage the rich trove of research and best practices amassed within DAM’s allied disciplines and honed by its practitioners within the cultural heritage sector would be a detriment to the continued advancement of DAM as a profession. Silence of the LAMs and DAMs? David’s clarion call signifies that the time is ripe for strengthening communication, education, and collaboration between information professionals who are engaged in applying information management principles to the practice of managing digital assets within both the public and private sector. We have a lot to learn from each other. The PDF doesn’t have the author’s name, date of publication, where it was published, and a URL or persistent identifier. Can it please be added so the article can be used for future reference? Thanks! Would like to share to my local community on LinkedIn.